The 14th gate came about immediately after partition fires burned Shahalami down. The Lahori Gate area was completely bottled up as the inhabitants of this part of the city were primarily Muslim. To the east of Lahori bazaar was a vast merchant class population that thrived in the numerous markets making up old Lahore, and they happened to be mostly Hindu traders. 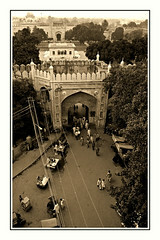 Between the fires of Shahalami and the aggressive Lohari Gate population, a very large number of people were trapped. A bit of geography will help to understand what happened at that critical moment in our tortured history. If you happen to turn eastwards from Lohari Chowk, one travels along Pappar Mandi. When this bazaar curves slightly southwards, it reaches a crossing known as Chowk Mati. From Chowk Mati the road curves slightly in a northern direction to meet the main Shahalami main bazaar. At Chowk Mati a narrow road, this was basically a residential area, a lane heads eastwards, and in 1947 it ended in a sort of cul-desac. At the end was a mosque, which is still there and which had a small well. Next to the mosque was a major well used by the entire area. This important well was known as Khajoor Khoo — (palm well). The well to the east had the outer wall of the old city enveloping it. This is where the lane ended, a lane known then as Ganesh Gali. One has not been able to ascertain why it was so called. Probably a temple dedicated to the Hindu deity Ganesh existed next to the mosque or near the well. The top of the well was such that one could climb over the outer wall. It seems that in the commotion that followed, this escape route opened up and people fled for their lives. If you know the old city well, you will know that the entire old city was dotted with wells, so much so that people would simply throw a bucket out of their ‘well window’ as it was called, and would draw up water. Khajoor Khoo was a major well, and people who did not have their own wells would use this one.The damaged wall was never repaired, and with time people used it as a ‘short cut’. In the 1960s the wall was so badly damaged that it was possible for mules and donkeys with loads on their backs to pass through with ease. It came to be known as the Khajoor Khoo ‘guzar’. The locals refused to recognise it as a gate, for no gate ever existed at this point, but a ‘guzar’ it certainly had become. Ganesh Gali was soon taken over by the fast expanding merchants of Shahalami and the lane was renamed Naya Bazaar — (new bazaar). The official address today is Naya Bazaar, off Chowk Mati, Pappar Mandi, inside Lohari Gate. The Khajoor Khoo in the 1970s was closed and filled up as the water table receded. On the well, land that is officially ‘nazool’ land, or state land, people started construction and built small shops. On the outer wall a new set of very small shops came up. By the 1990s the entire scene had changed and all traces of Khajoor Khoo and Ganesh Gali or the outer wall of the old city ceased to exits. A paved road was officially made, and nine years ago, traffic started flowing. On official maps no such place exists. In reality it is functioning. When Shahbaz Sharif came to power, he tried, even though his politics was empowered by the entrepreneurial classes, small, medium and large, he served notice on all illegal dwellers and tried to close this ‘guzar’. The move was opposed and by the time he decided to move in to close the illegal ‘guzar’, he lost power. Today Naya Bazaar is considered among the thriving markets of the walled city, even though the official position is that it does not exist. What is to be done now? Do we officially accept the new ‘guzar’ and name a gate after the area. It could be called Darwaza Khajoor Khoo and it will be officially the 14th gate of the walled city. But then the entire shops over the old well will have to be pulled down, a wall remade like the old one, as is planned in the Unesco plan for old Lahore, and a proper gateway constructed. Let the 14th gate of Lahore be called Darwaza Khajoor Khoo. There is more than a legend associated with Khajoor Khoo, for it was over 1,000 years old and made of small bricks. That, too, can be excavated. Also, 14 gates will mean, according to old mathematical calculations, of one and four making five, and five means Panj Pir as accepted by the Hussaini Brahmins. Let’s see what happens. This entry was posted in History, Lahore, Partition, Urban, Walled City and tagged Chowk Mati, gates, Lahore, Old city, Pakistan, Pappar Mandi, walled. Bookmark the permalink. 14 gate count karwa dain. mere khayal se 13 hain.